Fantastic 1:12 scale action figure of Chief Helmsman Hikaru Sulu! Based on the original Star Trek series. Boasts an accurate likeness of George Takei and a series-true uniform. Features 28 points of articulation, interchangeable heads and hands, and a host of accessories! Beam up this fantastic 1:12 scale action figure of Chief Helmsman Hikaru Sulu from the original Star Trek series! 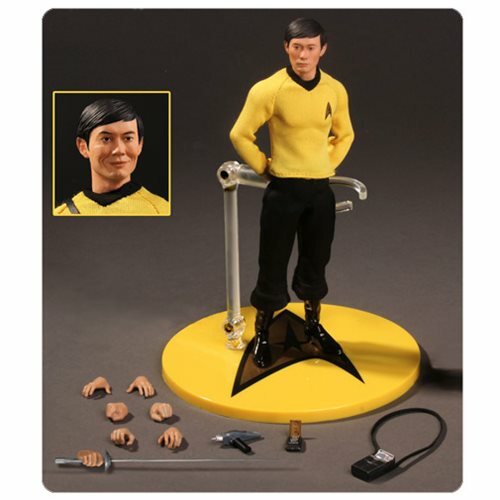 In a series-true uniform, the Star Trek Sulu One:12 Collective Action Figure is digitally modeled to render an accurate likeness of actor George Takei's features. It stands 6 1/2-inches tall and features over 28 points of articulation, interchangeable heads and hands, and a host of accessories. Sulu comes in a deluxe collector-friendly fifth-panel window box with a translucent acetate slipcover. Ages 15 and up.